The Project foresees the development and application of 20 Actions. Actions that ensured smooth administrative, legal and financial management of the project. The action aimed to feed the web-site of the project and to provide data for the following actions (e.g., soil monitoring action, pilot scale actions, integrated approach of measures and actions to be taken in the Mediterranean region, dissemination actions) during the entire duration of the project. Except results the web-site is used as an info-library and for this reason information/data relative to the theme “ Olive oil production in Mediterranean region” was collected. SSIA was the responsible beneficiary of this action and collected data and information from national and other Mediterranean countries’ sources; journal papers, technical reports, conference presentations in order to feed the info-library with data regarding soil types; olive oil mills’ activities, places of activities, volume and type of wastes, disposal type, soil pollution extent, actions have been taken to reduce environmental impacts; methods of soil chemical analyses; soil monitoring systems, strategies developed and applied; soil remedial/protective methods that have been applied or can be potentially applied, results, benefits, required equipment and cost; composting technology, equipment and cost, economical data; national environmental legislative framework; information for organized events (seminars, conferences) in Greece but also in other European countries. The collected data was in English and in Greek. The English informative material was sent to CERSAA for organizing and uploading to the web site, while the Greek was uploaded on the web site by SSIA. TUC collected data and information from books, journal papers, technical reports, conference presentations and other reliable sources. These data include among others: general information about surface- and groundwater and various environmental concerns associated with water; issues regarding water quality; analytical methods used to define the physical and chemical characteristics of water samples i.e. instrumental methods of analysis used in the laboratory or in field; water sampling programs and parameters to be considered (such as sample types, number and volume); legislation and common guidelines regarding drinking water quality (links to European Directives, Canadian thresholds etc are provided); assessment of risk for humans due to OMW application; inventory for OMW treatment technologies. TUC also significantly contributed to the collection of data to feed other website tabs such as news, conferences, links etc. Data have been collected in English (and also translated in Greek) and uploaded on the website of the project. These data were also useful for other actions such as pilot scale tests, integrated measures to be taken in the Mediterranean region and dissemination activities. CEBAS has completed the info-library on the Web page of the PROSODOL project with information about olive mill wastes (OMW) management. CEBAS collected data regarding olive mill waste management in Spain from scientific papers, technical documents and Internet and sent to CERSAA according to the proposal plan. Collection of information was continuous and fell within the time schedule. After that, CEBAS collaborated to write the text of the different section and subsections of the info-library and upload in the Web Page of the Project. The English text of this part and another parts of the Info-Library were translated to Spanish in order to complete the Web Page in this language. CERSAA has collected data for the establishment of the info-library. Scientific publications about OMW use/characteristics/management as well as legislative documents about different issues regarding soil, water, waste and waste management were mainly collected. CERSAA collected data files sent by responsible beneficiaries of Actions 2,3,4 and 6 for the entire project duration and categorized and organized them by theme. Specifically CERSAA organized data according to the 3 different axis which were previously identified: soil, water and waste management. Data sent mainly regard legislation about preservation and use of resources belonging to the compartments above mentioned and papers obtained by international reviews which deal with environmental issues about main outputs of research activities regarding soil and water bodies preservation, waste treatment, characteristics and use/disposal/treatment of OOMW, techniques for environmental monitoring, etc. Other subjects considered for the set up of the info library were the following: olive oil mills’ activities, places of activities, volume and type of wastes, disposal type, pollution extent of soil and water bodies, existing studies of regional pollution, actions have been taken to reduce environmental impacts; methods of soil/olive oil wastes chemical analyses; monitoring techniques to assess potential risks of olive oil mills’ wastes, principally aimed at evaluating and quantifying the presence of vegetal oils, the level of BOD and COD; methods for OMWs treatment applied so far, or investigated and applied in pilot scale, benefits, composting technology, equipment and cost, economical data; presentations from workshops and meetings; information of organized events (seminars, conferences) in Italy but also in other European countries. The team of IMS-FORTH was the responsible beneficiary for Action 6. Under the specific action, the team of IMS-FORTH undertook the design and construction of the official Web site of the project (implemented in 4 languages), which was enriched by various WEB_GIS applications. The site contributed to the dissemination of the results of the project, the establishment of a network among (and not only) the participating countries, the sharing of the information regarding olive oil disposal sites and the communication between the public and the participants. All the results of the project have been made available to the general public. Read here an executive summary of the achievements of Action 6. The preliminary study of the project area (today Municipality of Rethymno, former Municipality of Nikiforos Fokas) was completed between January and March, 2009. 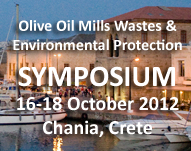 Collection and evaluation of all available data regarding population and local activities of the target area, number, characteristics and activities of the olive oil mills, hydro-, geomorphological and local meteorological data, initial assessment of environmental impacts caused by the disposal of OMW and identification of neighbouring systems, were carried out. Static maps were collected and uploaded on the website (http://www.prosodol.gr/?q=node/13). An integrated water sampling strategy, suitable for the entire Mediterranean region has been completed in the line of Action 9, to allow reliable assessment of impacts and define appropriate actions to improve and protect soil and water quality from the disposal of OMW. Full assessment of soil, surface and groundwater risk was completed by the end of the project. A risk analysis was carried out by using the “source of pollution-pollutant pathway-target (pollution receptor)” principle. Geostatistics was used for the assessment of risk while 3D maps allow the visualization of the range of selected parameters determined in soils and waters in the wider affected area. Deliverable: Report of preliminary study of the pilot municipality in Crete. A risk assessment of the pilot area (former Municipality of Nikiforos Fokas, Rethymnon, Crete) regarding soil quality and generalization of the assessment to cover also other disposal areas in Med area. A soil monitoring system that can be used by local/regional/national authorities and by individuals (e.g. mill owners). A carefully designed - based on the land characteristics of the area - monitoring system was implemented at the pilot Municipality, to monitor the quality of soil at olive mills’ wastes disposal areas. The monitoring system foresaw the collection of soil samples at various depths from a) disposal ponds/lagoons b) close and around to disposal ponds and mostly from the down slope side of the ponds c) downstream of the disposal ponds where extensive leaching due to surface and subsurface water movement is likely to occur. Soil samples were collected periodically (every two months), categorized relative to soil classification method and analysed for: electrical conductivity,pH, water saturation, total salts, texture, CaCO3, active CaCO3, organic matter, nitrogen, available phosphorous, cation exchange capacity, exchangeable K, exchangeable Ca, exchangeable Mg, exchangeable Na, water soluble Na, available Fe, available Mn, available Cu, available Zn, total polyphenols, available Boron, water soluble anions: Cl-. NH4+, SO42-, PO43-, NO3-, total heavy metals (Cd, Pb, Ni, Cr, Mo), microbial activity and pathogens content. 4th sampling between 14 and 18 December. 6th sampling between 17-21 May 2010.
active sites with surface disposal of OMW (ACTDS). Three active sites were monitored which are in operation for more than 11 years : ACTDS-1; ACTDS-2; ACTDS-3. river site (RS) located at the downstream of the active site with surface disposal of OMW. Soil samples along the river banks were collected and analyzed in order to assess potential of water pollutionandnutrient losses pollution, from soils of the upper hill slopes, through runoff or downward leaching. Olive Mills Wastes (OMW) were collected from the three mills of the area (three-phase) and analyzed for pH; electrical conductivity; total organic carbon; BOD; COD; total Kjeldahl N; NH4+; total phenols; Mg; Ca; total P; total K; Na; Cl-; NO3-; SO42-; PO43-; Cu; Fe; Zn; Mn; Ni; Cr; Mo. During the six sampling campaigns, 505 soil samples and 5 wastes samples were collected, while 16,120 analyses were conducted. One more sampling campaign was performed in June 2011 in areas close and far from the pilot Municipality in order to (1) confirm the evaluation results as far as the risk potential of the OMW disposal areas, and (2) identify potential Ni and Cr pollution of soils due to OMW uncontrolled disposal, issue that arose during the main soil campaign. Moreover, eleven drillings were performed (six from SSIA and 5 by TUC) in order to assess the possibility of pollutants transfer to deeper soil horizons as well as, which of the soil parameters are most likely to be affected in higher depth. Piezometers were installed by TUC in 5 drillholes to monitor pore water quality. Apart from the soil monitoring implemented at the pilot area and in order to assess the effect of uncontrolled disposal of OMW on soil and the risk for ground water contamination, more soil types were studied in laboratory. For this, eight different soil types, representative of Med area, were amended with raw OMW and changes in leachates properties were recorded. Read the main outcomes of the Soil Monitoring Action. In the line of Action 9, a carefully designed monitoring system has been implemented in the project area to monitor the quality of all existing water bodies including surface streams and groundwater. After 22 sampling campaigns in total, carried out bi-monthly between May 2009 and December 2012, water samples have been collected from surface streams, springs, water supply pipes and old wells. Water samples have been also collected from piezometers installed in 5 drillholes (1 of these is used as control) in the wider affected area. Drilling and installation of piezometers took place in the first week of November 2010. Monitoring of pore water quality was carried out every two months in the period February 2011 and December 2012 (12 sampling campaigns in total). Representative water samples have been also collected from four existing water abstraction wells. The parameters measured in situ include pH, electrical conductivity and dissolved oxygen; other parameters measured in the laboratory include COD, phenols, tannic acid, bicarbonate and total hardness, TOC, NO3-, SO42-, PO43-, NH3-N and elements such as Ni, Cr, Mn, Cl, K, Fe, Cu and Zn. Read the main outcomes of the Water Monitoring Action here. The action began on 1 October 2009 and was successfully completed during the foreseen period. The main objective was to evaluate the potential effects of wastes application on tree-land fertilization, the development of useful guide for the safe use of mills’ wastes in tree lands (olive trees) and the development of rapid methods of wastes analyses which can be used in field. A pilot scale experimentation site of around 1.500 m2 for the controlled use of OMWW for tree land fertilization was set up at CeRSAA’s premises. Around 200 two-years-old olive tree plants belonging to 3 different local varieties (Taggiasca, Pignola, Leccino) were transplanted. Two different kind of OMWW (deriving from a discontinuous and a continuous extraction system) were distributed. A drainage system was set up before plant transplanting, digging trenches of about 1 m depth and then positioning 10 cm diameter drainage tubes covered by a polyethylene tissue. 10 meters tubes were placed so to be connected at two opposite sites of the wells (5 totally), which have been used to collect leachate for subsequent analysis. In order to carry out the distribution of OMWW in the pilot area an hanging (50 cm above ground surface) dripline system was set up using Netafim Uniram pressure compensated tubes (normally used in the agricultural sector for the distribution of water or the application of liquid fumigants). Distribution of OMWs (OMWW and husks) was carried out in 2010 and 2011. Olive husks were distributed only in 2011. The control treatment is represented by water. Amount distributed in the pilot area were chosen in consideration of the following: 1. the soil texture, 2. the young age of plants, 3. the purpose to avoid severe interference with plant correct growth and/or heavy phytotoxic effect which could have significantly compromised the trials foreseen. Before distribution, an extensive survey of OMWW was carried out during olive season 2009-2010 at the 2 different olive mills: 1) Terre del Barone located in Borghetto S.S. municipality (Savona province, Liguria Region, Italy) which uses a three phases extraction method; 2) Maffei located in Orco Feglino (Savona province, Liguria Region, Italy) which uses a traditional discontinuous extraction method based on millstone and pressing columns. COD and BOD5 expressed as mg O2/ml and total oily matter expressed as g/l were monitored during a 4 months period between November 2009 and February 2010 in samples collected from continuous and discontinuous extraction systems. On the whole 170 analysis were carried out regarding 34 samples collected. A survey about OMWW distributed, leachates collected in the wells and soil sampled in the different plots and two different depths was carried out between the beginning of 2010 and July 2011. Read the main outcomes of the Action here. The action began on 1/10/2009 and was completed according to the timetable on 30/6/2010. The main objective was to perform microcosm experiments in order to establish the effectiveness of landfarming for bioremediating soils contaminated with olive oil mills´ wastes and to optimize this bioremediation technique in order to be implemented at the pilot area of the project. Bioremediation of soil contaminated with olive oil mill wastes by landfarming is a very competitive and low cost technology. A background study and characterization of polluted areas are necessary before landfarming implementation in pilot plots. Thus, CEBAS evaluated all available data regarding soil quality parameters and waste production details collected and sent by SSIA. During the 1st Monitoring Committee meeting, the Beneficiaries selected two polluted areas with priority for the bioremediation in base to the risk of pollution distribution and their high polyphenol content. The selected sampling points belong to the: (a) NF4 disposal area (large disposal area with two evaporation ponds where apart of disposal in ponds, the owner disposes wastes on the surface soil, and (b) to the inactive, for more than 6 years, NF6 area. A total of 5 samples were collected from these two areas: one sample and one control from NF4; one waste sample from the mill that dispose wastes at NF4 area; one sample and one control from the inactive NF6 area. Samples were air-dried and mailed to Spanish working team. The treatments that were assayed are: i) No treatment (natural attenuation); ii) Aeration; iii) Aeration plus nutrient addition; iv) Aeration plus microorganisms and enzyme inoculation; v) Aeration plus compost addition. In the treatment iv), we decide to amend the soil with a dose (200 mg C kg-1 soil) of the humic extract of a compost obtained in Spain using a two phase olive mill waste (TPOMW) as raw material. We also decide to add that compost to soil samples at an equivalent dose of 300 t ha-1 in order to assay the above mentioned treatment v). The soil parameters that were measured, apart from polyphenol concentration, were: pH, electrical conductivity, enzyme activities, assay of phytotoxicity effect (germination seed experiment) and ecotoxicity, measured by the effect observed on luminescent bacteria, will be carried out. In an additional experiment, the porous material (zeolite) of Action 12, which was being implemented by SSIA, was used as soil additives in order to study if their presence enhances the biodegradation process. In this second experiment, the treatment applied to the selected soils (4.18, 4.19, 6.1 and 6.2) were four: i) No treatment (natural attenuation); ii) Aeration; iii) Aeration plus zeolite addition; and, iv) Zeolite addition. In January 2010, CEBAS received the soil and olive mill wastewater (OMWW) samples for lab bioremediation experiment from SSIA. Soil samples NF 4.19 and 6.1 (contaminated soils from both areas) and NF 4.18 and 6.2 (control soils from the respective areas) were homogenized by 2-mm sieving and analyzed in order to determine the concentration both of polyphenols and some chemical elements. Chemical analysis results are included in the progress reports (see web site at partners area>progress reports). A very interesting result is the Ni concentrations of the soils; in all cases, they were higher than the limit values proposed both by the EU in the 3rd draft of the Working Document on Sludge (European Commission, 2000) or in the Directive about the use of sewage sludge in agricultural soil (86/278/CEE) and the Spanish Ministry of Environment (Royal Decree 1310/1990) and could come from the steel of metallic machinery used in the olive oil production. The experimental design has foreseen the preparation of 60 plastic containers with 250 g of soil and the application of the above mentioned treatments in triplicate to the 4.19- and 6.1-polluted soils (Figures 1-8 of the respective Annex). The nomenclature for each treatment is shown in Table 1 of the respective Annex. After a pre-incubation soil sample during 2 weeks, a fresh OMWW was added to soil. The dose of OOMW added was equivalent to 500 m3 ha-1 that represents 10 times the maximum dose that Italian legislation permits for the use of this kind of wastes in soil irrigation. Soil samples were collected from the different microcosms for the different analysis programmed, at 15 days before the fresh soil spiking with fresh OMWW (T0) and 3 days after then (T1). Moreover, soil samples were collected at the following time periods after T1 sampling time: i) after 15 days (T2); ii) after one month (T3); and iii) after two month (T4). In the second experiment performed to assay the effect of zeolite on the bioremediation of soil contaminated with OMWW the dose of zeolite was 30% weight basis. In order to achieve the Action’s objectives and develop and deliver a suitable bioremediation technique for the project’s disposal area, CEBAS fulfilled a series of actions and studies. Read the main outcomes of the Action here. Deliverable: A guide for the application of bioremediation at large scale. Deliverable: Financial and Technical evaluation of demonstration action. The Action began on 1st October 2009 and was successfully completed on 30th June 2010, according to the project timetable. The aim was to optimize the technique of using porous materials as soil additives in order to protect and further improve soil quality at OMW disposal areas. Read the main outcomes of the Action here. In the frame of Action 13 a feasible and integrated low cost OMW pre-treatment methodology using various reactive agents has been developed in order to be applied in small olive mills that are mainly family businesses and widely dispersed in the Mediterranean region. The pre-treatment methodology was optimized in large laboratory scale prior to the implementation in field. Field tests were carried out in the line of Action 14 in the period November 2011-April 2012. Raw OMW that was used in laboratory and field tests was obtained from a three phase olive mill operating at Agios Konstantinos village, Rethymno prefecture, Crete, with an average annual production of 2000 m3 OMW. Various materials, including goat manure, zero valent iron, iron fillings, saw dust, Ca(OH)2, industrial lime, FeSO4.7H2O, magnesite by-products, natural zeolite, limestone and activated carbon were used in OMW pre-treatment experiments. Most of these materials are low cost, by-products of other industrial processes and are abundant in Crete and other parts of Greece. Based on the experimental results a flowsheet for OMW pre-treatment (three different options) has been proposed and also the effects of pre-treated OMW on spinach and beetroot growth have been studied. Centrifugation and saw dust addition (2 g/L of OMW) are considered as important initial stages since they contribute to the removal of most oil and solids and improve solid/liquid (S/L) separation and the efficiency of the following stages, reducing thus consumption of reagents. Parameters such as pH, phenols concentration, BOD and COD removal are not affected by centrifugation, as anticipated, but 20% TS removal is obtained within 5 min. The recovered oil (around 3% w/w of the feed) can be further treated and potentially used for the production of other products such as lubricants, preservatives and cosmetics. Addition of 7 g/L FeSO4.7H2O in the following stage of the first pre-treatment option results in coagulation and cumulative removal of TS up to 35% w/w. As shown in the following stage, addition of 10 g/L Ca(OH)2 provides alkalinity in the system (pH increases from 4.7 to almost 8) and also results in significant removal of phenols and COD (up to 65% and 30%, respectively). Finally, addition of iron fillings (10 g/L) and 10% v/v H2O2 (30% w/w) results in an additional 60% phenols removal. Iron fillings can be easily recovered and re-used for several times until exhaustion. The second pre-treatment option involving liming with 10 g/L Ca(OH)2 and addition of 30 g/L Ca(ClO)2 results in 98% phenols removal and decolourization of OMW. TS and BOD are also substantially removed. In the third pre-treatment option, OMW was filtered through a 20 cm goat manure substrate after a retention period of 8 days and the quality of the final liquid is substantially improved (pH~6.5, phenols and COD removal by 90% and 25%, respectively). These results indicate that goat manure, which is available in large quantities in Cretan agricultural areas, may be considered as potential substrate in evaporation ponds that is able to reduce the volume and improve the quality of the generated leachates and thus minimize the risk for soil and groundwater contamination. All three pre-treatment options resulted in the production of OMW with rather similar quality. The precipitates (sludge) collected after each treatment stage may be used for the production of compost, after mixing with other agricultural wastes such as straw, tree branches and olive leaves, provided that phytotoxicity tests are carried out prior to its use as soil amendment. In order to assess the quality of the pre-treated OMW as well as study its effect on plant growth, laboratory tests were carried out using spinach and beetroot; these tests were not included in the original proposal and were carried out at no additional cost. The results have shown that low OMW application rates (4L/m2) have rather limited effect on spinach and beetroot growth, at least for the cultivation period considered (6 months); when higher OMW application rates are considered (10 or 20 L/m2) plant growth is more adversely affected, especially for beetroot. Optimized OMW pre-treatment was thereafter implemented in the field with slight modifications. Centrifugation of OMW, which enables fast oil and paste precipitation, was not implemented in the pilot area due to the lack of equipment (a centrifuge of this size is quite expensive). The OMW pre-treatment stages in the field are described in detail in the following section 5.1.13. The pilot scale application began on 1 July 2010 and it was completed on 30 November 2012; nine months later than the initially foreseen end day (i.e. 31/3/2012). The aim of the action was to demonstrate at field level all the techniques developed in lab scale, i.e. soil remediation (based on results of actions 11 and 12), pre-treatment of OMW (based on action 13); and finally composting (based on already scientific experience and on the results of the wastes chemical analyses). One more action that it was proposed and accepted by the EC, which, however, was not foreseen in the initial proposal, was the application of pre-treated wastes for lettuce cultivation and evaluation of effects on the production and on soil. The last action was proposed since it was considered as highly important to study and propose an integrated strategy, i.e. pre-treatment of wastes in field and subsequent use of treated wastes on soil or for crop cultivation. Results of Action 8 and 9 were also considered when developing and implementing all demonstration actions. Read the main outcomes of the Action here. Olive mills are family businesses and small-scale enterprises. Seasonal production of wastes and their variable character of the residue. The legislative act should clearly specify that the waste should be analysed Standard sampling and analytical procedures, harmonised at EU level, could be introduced. In case evaporation ponds are used, the minimum requirement should be the use of protective layers (engineered evaporation ponds). As landspreading is a common and low-cost practice, specific regulations should be developed. In case of landspreading and under the condition that the olive oil waste/wastewater fulfills the requirements of the existing legislation, the OMW could be considered fertilizer and thus, annual dose estimation should follow the general rules of soil fertilization considering soil properties and purpose of use. The regulations should take onto account (a) the use of the land (b) the soil type and (c) the period of reuse. OMWs are usually discharged in small stream catchments. For this fact, there is a need for including small streams into monitoring and assessment schemes as small streams contribute to the pollution load of the river basin. EQSs should be set in a EU Directive in the same way that is done for water bodies, at least as minimum requirements per soil type. The threshold for pollutants (as phenols) concentrations in soil could be set in such values as to reflect existing soil maximum background concentrations in natural undisturbed soils. The report delivered is considered very significant; since it integrates all PROSODOL activities and finally satisfies the main objective of the LIFE call namely “ENVIRONMENT POLICY AND GOVERNANCE”. The analysis clearly indicates the need for certain provisions in the EU legislation in order to valorise this waste as by-product and in the same time to protect the EU soils from adverse pollution. The legislative and policy recommendations were based on the particularities of olive oil industry in the Mediterranean area. The proposed approach is to start from an objective reconstruction of the legal framework on waste management and accommodate it to the particularities of the olive oil waste. The deliverable was translated in Spanish, in Italian and in Greek. The integration, after financial and technical evaluation, will result in an efficient strategy suitable for Med countries. Restrictions and conditions will be also considered and recorded. Solutions or alternative scenarios will be proposed, if needed. The Spanish dissemination plan is divided into four parts of activities: dissemination to national stakeholders, dissemination in the Mediterranean region, dissemination to national authorities, and international dissemination. The Italian dissemination plan is divided into four parts of activities: dissemination to national stakeholders, dissemination in the Mediterranean region, dissemination to national authorities, and international dissemination. The Greek dissemination plan is divided into four parts of activities: dissemination to national stakeholders, dissemination in the Mediterranean region, dissemination to national authorities, and international dissemination. Project Monitoring will last 48 months (entire duration of the project) and aims to measure and document the effectiveness of the project actions as compared to initial situation, objectives, expected results and environmental impacts. An after-LIFE Communication Plan will be developed, since it is important the continuous dissemination to be guaranteed. Thus, a plan will be developed to ensure the dissemination and potential implementation of project's achievements, through stakeholders and mainly through Agricultural Associations, which are in position to distribute information and knowledge among their members.